[Tyler Spilker’s] DDD project is a Digital Dead Drop system based on Python and a Raspberry Pi as a server. It’s pretty rough around the edges at this point — which he freely admits. But we like the concept and figure it might spark an interesting conversation in the comments section. Now by far our favorite dead drop concept is this USB drive lewdly sticking out of a brick wall. But you actually need to be on-site where this drive is mortared into the wall in order to access it. [Tyler] instead developed a webpage that gives him a text box to enter his messages. These are encrypted using key pairs and pushed to his remote RPi server. This way he can write down his thoughts knowing they’re stored securely and never in danger of being accessed from a lost or stolen cellphone. If free thought isn’t what you’re trying to transfer from one place to another you probably want something like a Pirate Box. Build a better lock and someone will make a tool to open it without the key. Or in this case they’ve made a tool to discover the key using a trip to through the deep freeze. The Forensic Recovery of Scrambled Telephones — or FROST — uses cold temperatures and a custom recovery image to crack Android encryption keys. Cold boot hacks go way back. They leverage use of low temperatures to slow down the RAM in a device. In this case, the target phone must already be powered on. Booting a phone that uses the encryption offered by Android 4.0 and newer requires the owner’s pass code to decrypt the user partition. But it then remains usable until the next power cycle. By freezing the phone, then very quickly disconnecting and reconnecting the battery, researchers were able to flash their own recovery image without having the encryption key cleared from RAM. As you can see above, that recovery package can snoop for the key in several different ways. [Damcave] decided to try out some bar code reader projects. He got his hands on a CueCat years ago. The problem is that it outputs encrypted character sets instead of a clear text string. To get around this he used his Arduino to decrypt the CueCat’s data output. Originally you could get you hands on a CueCat for free. It was meant to work like QR codes do now — you see a bar code, you scan it to get to a web address. It never really took off but you can still get your hands on one for about twelve clams. We’ve seen projects that clip a pin on the processor to disable to encryption. But [Damcave] didn’t want to mess with the hardware. 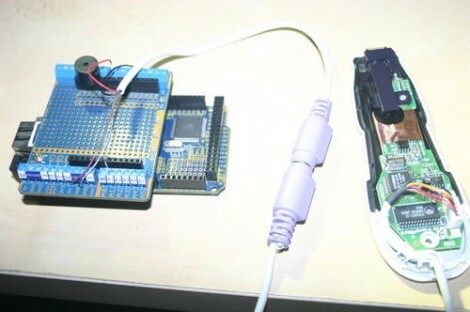 Instead he connected the Arduino via the PS/2 connector and used software to translate the data. The encryption format has long been know so it was just a matter of translating the steps into an Arduino function. The Google Power Meter API is no longer in development but that didn’t stop [Pyrofer] from finishing his metering hardware. It uses a reflectance sensor to read the meter instead of using clamp-based current sensing. GhostCoder lets you encrypt and hide audio files within other audio files. The thought is, you can piggyback your own data into Torrents that are circling the interwebs. If you’re skilled with a Skill saw you can make a chair out of one 2 by 4. You can see the pattern you’ll have to cut out from the board in the image above, wow!